V2457. 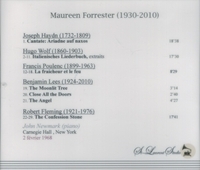 MAUREEN FORRESTER, w.John Newmark (Pf. ): Songs by Haydn, Wolf, Poulenc, Benjamin Lees & Robert Fleming (the final song in Fleming's CONFESSION STONE Cycle is incomplete). (Canada) St Laurent Studio YSL T-338, Live Performance, 2 Feb., 1968, Carnegie Hall. [Excellent sound in the Carnegie Hall acoustic, recorded on an Uher recorder with Sennheiser mike from a choice location in the Hall, far from audience members, virtually unmarred by audience noise, albeit the Seventh Avenue subway makes its ubiquitous rumbling appearance both arriving . . . and then departing! Recorded independent of extraneous audience noise, this recording captures the spontaneity of the recital with no more than the occasional applause at appropriate moments, never within groups - it was a duly cultured audience! Never previously issued.] Transfers by Yves St Laurent. "John Newmark (Neumark) was a pianist, accompanist & chamber musician, born in Bremen, 12 June, 1904, then naturalized as a Canadian in 1946. Newmark wanted to leave Germany, but it was not until 1939 that he was able to get to London. There he took part in concerts, notably with the soprano Emmy Heim and the violinist Max Rostal. In 1944 Newmark settled permanently in Montrï¿½al, where his services were soon in demand by eminent Canadian and foreign soloists. In 1949 he gave concerts in South America with Goldberg and accompanied Kathleen Ferrier on two extended tours of North America. With her, in 1950, he recorded song cycles of Schumann and Brahms for Decca-London & Brahms' 'Vier Ernste Gesänge. In 1952 he won a Grand prix du disque de l'Académie Charles-Cros. Newmark accompanied more than 80 foreign and at least 160 Canadian artists and has recorded with several of the most prominent. 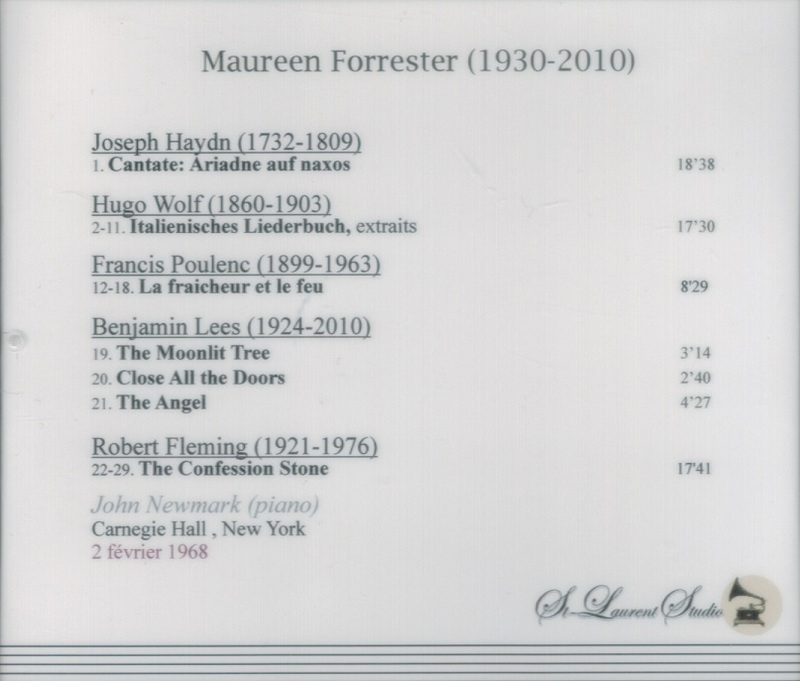 His long collaboration with Maureen Forrester began in 1953; with her he toured the world. 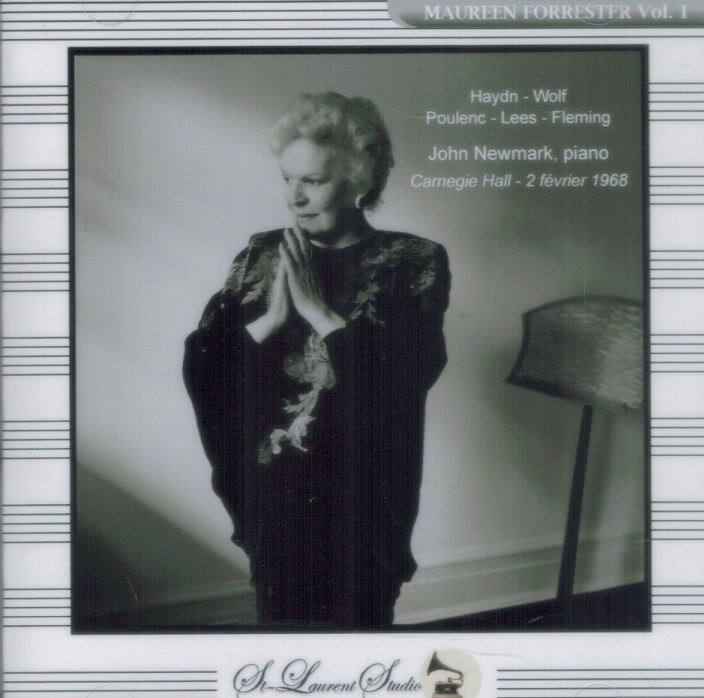 After a Toronto recital by the team, John Kraglund wrote (GLOBE AND MAIL, 18 Jan 1960): 'Superb as Miss Forrester was, much of the credit for the exceptionally high quality of the recital must go to Mr. Newmark. Always a reliable accompanist, he gave inspired performances throughout the evening, providing an integral part of each song, without being guilty of either too much or too little'."